The thing that fascinates me about The Aylesford Skull is structure, which, given both the titular skull and the climactic scenes’ location, seems rather appropriate. There’s a perception, rightly or wrongly, that steampunk is easy to do badly; simply scatter a few top hats, airships, demented science experiments and bare knuckle boxing matches into a pot, simmer for 400 pages and serve, seasoned with cameos from historical notables. It’s certainly one of the most visually distinctive sub genres of fiction and it’s easy to see how that creates a framework for an author to hang the flimsiest of plots off. Blaylock certainly plays with this, all those elements are here in some form, but he does so in a way which feels grounded and organic. This is steampunk, most certainly, but it’s steampunk because of much more than simply brass buttons and airships. Blaylock peppers his plot with huge structures and ideas, but the bones of the novel are as intricately assembled as any of St Ives’ devices. This is most obvious in how Blaylock deals with his characters and their relationships. St Ives is at the centre of a rich, inter-connected web of characters including his wife, Alice, and children, friends Tubby Frobisher and Jack Owlesby, their relatives, their contacts at the Society, St Ives’ neighbours, including Mother Laswell and Bill Kraken, himself reintroduced from previous books, and Finn Conrad, one of St Ives’ servants. Through them, the novel spins out to Mother Laswell’s family and tragic past, Doctor Narbondo himself and, through Finn, a whole raft of dubious characters from his time living on the streets of London. Each one of these people is connected to the others and once the plot picks up, Blaylock triggers chapters of events simply by having one of these people take action, knowing the others will all react. It’s a very clever structure, simultaneously keeping the plot moving along and constantly in the service of the characters. It also lets him do something a little different to the standard two-fisted gentlemen adventurer, as St I ves spends much of the novel stricken with guilt over his son’s kidnapping and his inability to prevent it. Blaylock’s entirely too good a writer to reduce the plot to ‘this time it’s personal’ but that element of personal conflict lies at the heart of the entire book. Narbondo is using his past and St Ives’ future as the weapons to destroy England, St Ives and Alice are dead set on stopping him and everyone else is caught up in that simple, brutal narrative algebra. This is, at its core, a tale of two families; the St Ives, and Narbondo’s own horrifying past, and how they differ. Once again, Blaylock’s far too clever to paint things entirely in monochrome, and we get a lot of information, and implication, about exactly why Narbondo turned into the evil genius he is here. That in turn only heightens both the stakes and the tension, especially in the latter half of the book. Structure also comes into play with the novel’s subject matter. Narbondo’s use of the skull of his murdered brother, fitted with a ‘spirit lantern’ as the catalyst for not only a massive assault on London but to open a doorway to hell is one wrapped up in his own hideous past. He’s trying to use his beginnings to end everything, and that fatalism, as well as his kidnapping of Eddie St Ives, forces other characters to examine their own choices. Finn Conrad’s guilt at not being able to stop the kidnapping, as well as his crush on Alice drives him to London to try and make amends even as St Ives himself sets out for the city. At the same time, Mother Laswell, guilt stricken at the crimes her son has wrought decides to end him, and in doing so, is forced to re-examine her own relationship with the dogged, faithful Bill Kraken. This culminates in a pair of bravura action sequences, unfolding across multiple chapters, where each set of characters come together in the same place at slightly different times. In each case, Blaylock plays the audience’s expectations supremely well, showing us consequence without context in one chapter, before going back to another group of people in the next chapter and explaining how their actions led to what we’ve already seen. It’s a structure that’s both very clever and specifically evokes the page-turning cliffhanger-a-minute style of popular serials. This is a novel, as I said at the start of the review, that’s steampunk down to its bones and it’s all the stronger for that. Structure plays other roles in the novel, most notably in the sheer scale of the finale, but to say anything else would be to spoil the big finish for the sake of analysis. 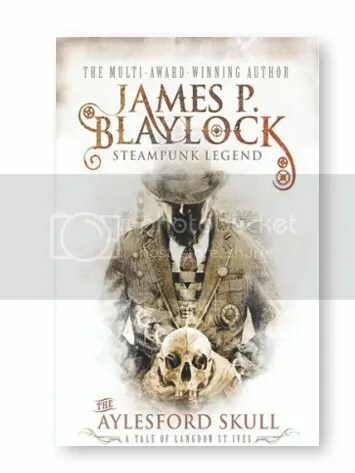 What can be said is that Blaylock uses the narrative architecture of steampunk, pulp serials and the bonds of blood and love that define two very different levels of family to create a novel which is remarkably accessible to newcomers to Langdon St Ives. You never feel adrift but never feel cosseted, the structures and tropes of both steampunk and history carrying you through to the end of the novel with ease and a constant combination of spectacle, unflinchingly brutal violence and gentle, urbane humour. There’s style here certainly, plenty of brass buttons and gentlemen adventurers, but look beneath that and this is a beautifully designed story that balances form and function to create an exceptional return to a much loved character.